Any HBKA member interested in looking at pollen and making slides of pollen samples, Danuta and Jo will be at the apiary from 10 until 12 on Sat 16th July. If you have a compound microscope then you are welcome to come along and bring it too. There will need to be a limit of 15 maximum so it will be those who make contact first. Priority will be given to those who have not been able to attend other sessions before or those with microscopes who are hoping to take the interest further. 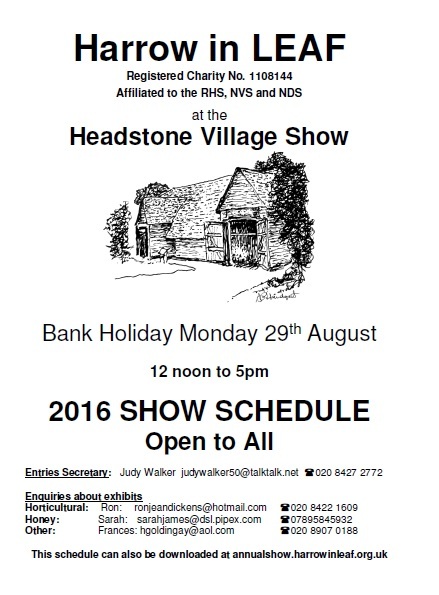 HBKA Annual Honey Show 2016 is again part of the Harrow in Leaf show, which is in turn part of Headstone Village Show at Headstone Manor on Bank Holiday Monday 29th August. The full show schedule is downloadable from the Harrow in Leaf show website and includes the honey and wax entries. Next up at the apiary is the second hand equipment sale. starting 11 am on 22nd May. Then the Social Evening on 18th June from 4.30 pm. Bring family and friends and a dish to share. Soft Drinks provided. Contact Carole Adams, who would appreciate knowing whether your dish is sweet or savoury. Check the diary page or subscribe to the ical feed.